Through our CeleroOne® platform, companies from a variety of industries define their workflows to manage their field organisations efficiently, with a focus on success, and therefore with a high degree of economic efficiency. 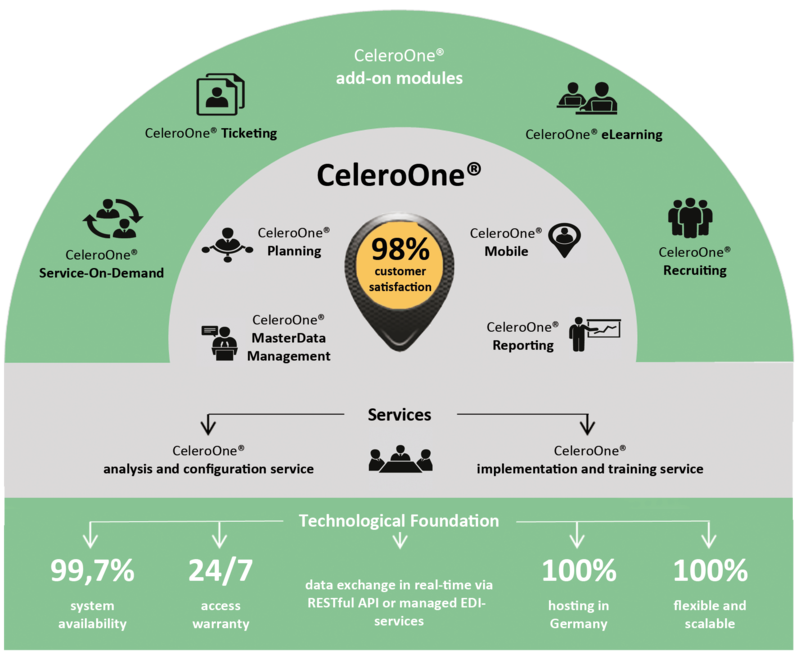 CeleroOne® provides the ideal tools for the targeted use of employees and offers all functionalities for an optimum personnel planning, resource management and performance reviews. CeleroOne® organises every step into a transparent and auditable real-time image. This allows individual KPIs to be tracked anytime, anywhere, ensuring immediate responsiveness when needed. As a result, quicker and more informed decisions can be made and the quality of the processes can constantly be improved. The field tested CeleroOne® platform can be used immediately and can be extended at any time through additional modules. CeleroOne® is intuitive to use and is supported by all standard mobile devices. This reduces the costs of implementation and minimises time-consuming training - especially during ongoing operation. CeleroOne® offers the flexibility through its cloud-based usage to adapt or parameterise commercial processes and procedures at any time.